Following yesterday’s imaginatively titled Part One, today Pies profiles the home kits of the 10 Premiership teams who would have their names called at last on the school register. There is a hint of baseball to Citeh’s new shirt, with its rather fetching white pinstripes. Reebok are out and French brand Le Coq Sportif (currently enjoying a Lazarus-style revival) are in. Last season’s white sleeves are also ditched, and on reflection it is probably a good call. Thomas Cook are still the sponsors, which will be handy if Sven or one of his squad of United Nations need to nip home for a few days. Click here to buy it from Kitbag. I don’t want to like it, but I do. 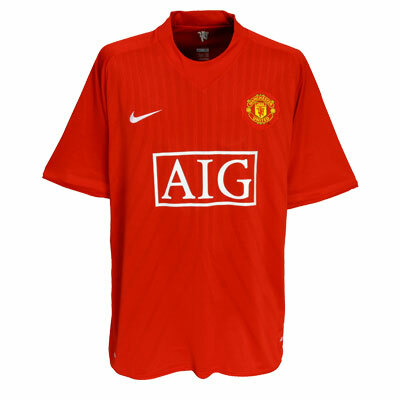 There is something clean and minimalist about United’s new shirt which makes it quite eye-catching. There is also a single white stripe on the back of the shirt if it is a little too simplistic for your liking. Probably doesn’t quite live up to last season’s retro effort with the white trim and v-neck, but there is no shame in that and it does come pretty close. A shirt fit for this season’s champions? Click here to buy it from Kitbag. The mystery around Boro’s new kit is that it doesn’t seem to be for sale anywhere at the moment! It isn’t on the official website or any of the big shirt suppliers. The kit is supplied by Errea again, but the new sponsor is Garmin Sat-Nav. Whether this helps the Middlesbrough players find their way to the goal this season remains to be seen. Following the lead of the fashion gurus at Barcelona, the Magpies have thickened up their stripes. The visible front-on stripe count is down from seven to five, and black replaces white as the most prominent colour. The Toon Army will look less like barcodes than they have for a while. As it has been since the dawn of time, well since the Kevin Keegan years at least, the kit is supplied by Adidas. Click here to buy it from Kitbag. Pompey have gone all rugger on us with a shirt provided by oval ball specialists Canterbury. The New Zealand brand got a foot in the Premier League door by supplying Petr Cech with his protective headgear after his injury last season. The new kit is a v-neck and a little more traditional that the kit supplied by Jako last season. Last season’s yellow detail is replaced by gold trim. There is also three light blue circles on the sleeve if that improves the shirt in your opinion. 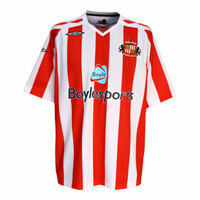 Click here to buy it from Kitbag. I can’t decide whether Reading have changed their kit or not. Ahead of their tricky second season, the Royals seem to have made slight adjustments to their home shirt. It is almost identical to last season’s effort but the stripes on the sleeves seem to have swapped round. Perhaps an infuriated/quite pleased Reading fan could tell us whether they have had to buy a new shirt this summer of not. Click here to buy it from Kitbag. The Black Cats stick to what they know with their traditional red and white stripes. As with the vast majority of new Umbro shirts, this kit features some pretty dodgy diagonal shoulder detail. The shirt is sponsored by Irish bookmaker Boylesports, which has Sunderland at 3/1 to be relegated if you were wondering about any potential for split loyalties. Haven’t been tempted to follow rivals Newcastle in going for fat stripes. Click here to buy it from Kitbag. Spurs are commemorating their 125th anniversary by making sure we know about it. The slogan 125 years appears under the simplified club logo (celebrating its first anniversary). Other than it is very much as you were for Tottenham fans, with exception to the transition to a v-neck collar. Poor Dimitar Berbatov didn’t really need anything to make his neck look longer, did he? Betting firm Mansion continue to sponsor the shirt, for now at least. Click here to buy it from Kitbag. Another shirt featuring those Umbro diamond sleeves. As mentioned yesterday, West Ham and Aston Villa’s colours are even more similar than usual this season. The thought of Carlton Cole wearing a shirt with a big XL on the front had me chuckling for a bit (nothing like stating the obvious, eh?). But then I realised the chances of Carlton Cole wearing a West Ham shirt this season are pretty slim. 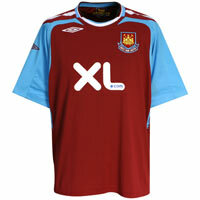 Click here to buy it from the Hammers themselves. The Latics has swapped last season’s blue with white trim for blue and white stripes this time around. While the kit is still sponsored by JJB, they are no longer the kit suppliers. Umbro have taken over in that department and with them they brought, you guessed it, the diagonal shoulder detail. I don’t know if it is the design or just the fact that is says JJB on it, but this looks like a Sunday League shirt to me. 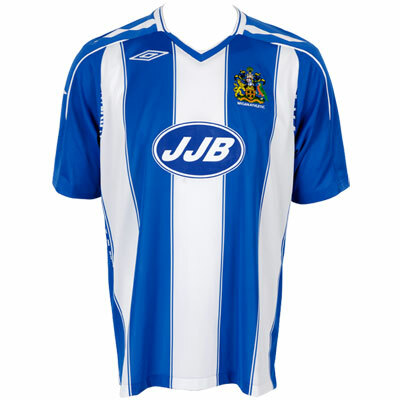 Click here to buy it from JJB.